Interest rates are at a historic low and many people are, understandably, looking to find the best way to make their pension pots and other savings work harder. New pension freedoms introduced by the government in April 2015 give individuals greater flexibility to access their savings. Savers can fall victim to sharks and scammers keen to get their hands on these savings which have been built up over a lifetime of work. Investigations carried out by the Insolvency Service during the 2015/2016 led to the winding up of five such companies in the public interest. 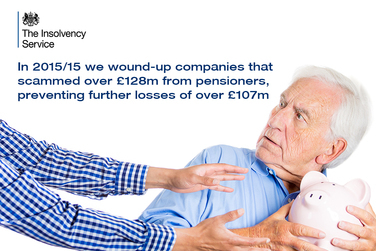 They had obtained over £128 million from members of the public and we estimate that by winding them up we prevented further losses of at least £107 million. We will also seek to prevent the directors of these companies from going on to set up new companies where we have sufficient evidence of wrongdoing. An example was the director of Carrington Wire Limited (CWL) who was disqualified for 12 years in November 2015 after the company to failed to meet its obligations to a defined benefit pension scheme, as well as facilitating a series of transactions that enabled an unconnected Russian company to also avoid its liabilities to the pension scheme. If you have suspicions that a company is acting against the public interest you can report your concerns to us. For top tips on how to spot pension scams and protect yourself check out the advice issued by The Pensions Regulator. We are currently analysing the 70 submissions we received on proposals announced in May to improve the UK’s corporate insolvency framework. Our insolvency regime is highly regarded internationally but we want to ensure that it continues to deliver the best possible outcomes for business. We are considering updating our regime in light of international principles developed by the World Bank and the United Nations Commission on International Trade Law (UNCITRAL), as well as in the wake of recent large corporate failures. Under consideration are four broad areas for reform, including introducing a moratorium, widening the definition of essential supplies, developing a new restructuring plan and increasing the availability of rescue finance. The Government will publish its response to the feedback we received in due course. We hosted Insolvency Live! at the end of July for insolvency and debt advisory professionals. The event provided an opportunity to hear from our senior staff, ask questions and share feedback. Around 70 insolvency practitioners, debt advisers, creditor representatives, regulators and others joined us. We have published highlights online for those who were unable to attend, including video podcasts of the opening address by our chief executive and Inspector-General Sarah Albon and the presentation on the outlook for the economy. We are in the process of asking attendees what they thought with a view to running a bigger and better event next year. We would welcome your suggestions for the 2017 event as well. A revised table of fees for bankruptcy and company insolvency applications was introduced on 21 July 2016. The revised fee structure has been designed to achieve as close to full cost recovery as possible and works on the principle of matching revenue to work carried out. We are required to set our fees to cover our costs. The changes follow a review of our previous fee system with officials from HM Treasury after concerns that it was out of step with Managing Public Money principles (that those who receive a service should bear the cost) and puts the agency on a more sustainable financial platform. The new table of fees is more transparent, reduces the cross subsidy between cases with assets and those without, and enables creditors and debtors to clearly understand upfront what it will cost to initiate an insolvency and have it administered either by the Official Receiver or by an Insolvency Practitioner. All cases already with the Adjudicator’s Office will continue to be dealt with by them. Tiers 1 and 2 of our complaints process remain unchanged. More information about our complaints process, including the new arrangements for tier 3, is available on our website. We continue to welcome your comments on how we can continue to improve the tool. 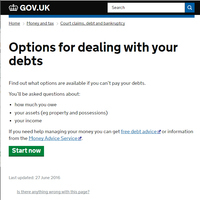 We’ve launched a new landing page for debt advisers which provides a single entry point for tools and information from across GOV.UK. We hope you find the single page useful and welcome any feedback you may have about how we can improve it. The new survey will be run annually by an external research agency using computer aided telephone interviews, with fieldwork conducted around February to March each year. The Stationary Office would like to hear from insolvency practitioners about how you place notices in The Gazette. It has compiled a short survey which you are invited to complete. The results of this survey will help The Gazette optimise services in the future, making them as relevant as possible for you and your organisation.